This large industrial building contains a production and fabrication area for metal roofing, windows and structural members, together with management offices with a sales area and showroom for the products. The factory was seen as an opportunity to showcase the work of contour, and to reinforce their brand. The design astutely provides a dynamic showcasing of the client's product in a way that is both visually compelling and sympathetic to the wider environment. It's strength is in the carefully detailed monolithic roof form that spans the building from south to north with roof windows for daylight, sunlight and ventilation. The curved ridgeline echoes the rolling hills that form a backdrop to the building and avoids the usual ridge flashing that characterises industrial sheds. Influenced by artists such as George Seurat and Bridget Riley, as well as local artists, the roof colours provide a striking part of the design. The colours are drawn from the standard Contour colour range, using blues, greens and silver greys which are the naturally occurring colours of the surrounding sea, sky and mountains. The blended colour provides a shimmering pattern that alters according to prevailing lighting conditions, enabling the large building to sit comfortably within the setting. 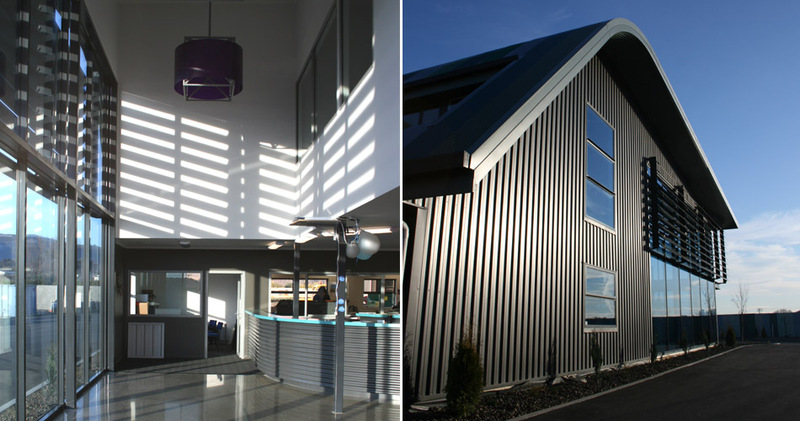 Intended to be visually stimulating, the building provides an iconic presence at a principal gateway to Nelson.